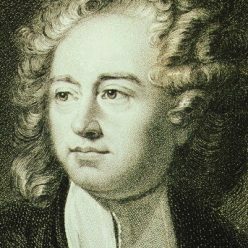 The American pop singer P.J. 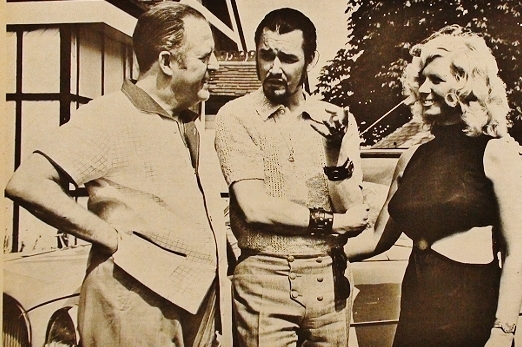 Proby, famous for splitting his trousers on stage, with Eddie Joyce and his wife, the owners of the newly opened Lawrence House Country Club, in June 1970. Previously the building had been home to the Managing Director of Bentley’s Yorkshire Breweries and the setting for village garden parties. Oulton born Eddie Joyce was a larger than life character who overcame a serious accident when he was a young man and went on to build a series of successful businesses eventually returning to his roots to run a restaurant in Woodlesford. Known to family and friends as Teddy, Edward Michael Joyce was born in August 1917 just a few months after the marriage of his parents at St. Joseph’s, the Catholic church in Hunslet. His father, Michael Joseph Joyce, had migrated from Ireland and went on to work for most of his life as a miner at Water Haigh colliery. He was born in 1893 at Ballyovey in County Mayo and probably came over at the start of the First World War when there was a shortage of miners after many men joined the army. Eddie’s mother, Elsie, grew up in a house in the small community at Fleet between the Aire and Calder Navigation and the River Aire. Her father, William Armitage, was a labourer at Bentley’s brewery when she married but earlier he had been a platelayer on the railways around Methley, moving there from Snaith in the 1870s. In 1880, at St. Oswald’s in Methley, he married Selina Tree, the daughter of a bricklayer who also grew up in Snaith. The Joyce family lived first at New Row in Oulton, a single storey row of stone built cottages which ran between the Primitive Methodist chapel on Aberford Road and Quarry Hill. Over the years Michael and Elsie had six children, three girls and three boys, and in 1934 they moved into a council house on Green Lea. Eddie went to Oulton school leaving there at the age of 14. A few years later he was employed at Armitage’s brickworks on Eshald Lane where he played for their football team. In the 1937/38 season they were runners up in the Ramsden Cup and in the following season Eddie scored 16 goals when the side won the Leeds League Cup (Division 2). However, shortly before the Second World War, whilst he was working as a brick presser, he lost all the fingers of his right hand when it was crushed in a machine. No prosecution seems to have taken place in Eddie’s case but in April 1940 Armitage’s were fined £5 for having dangerous machinery. They were prosecuted after a 14 year old Rothwell boy, Henry Wadkin, lost part of two fingers in a similar accident when he was left in charge of a tile pressing machine. His next move came around the end of the war when he bought the Penraven Hotel, a boarding house on Derby Road in Blackpool benefiting from the large number of American servicemen who were stationed in nearby Lytham. In 1947 it advertised a “sea view, spacious lounge, chef cuisine, board and residence, 18/6 daily.” A few years later he bought the house next door and doubled the capacity. Towards the end of the 1950s Eddie Joyce sold up the hotel business in Blackpool and moved back to Leeds. He bought and converted an old cinema on Woodhouse Street into a venue called the “Ace of Clubs.” As a theatre club and casino it featured many of the up and coming performers of the 1960s made famous by their exposure on television and radio. Amongst them were the singers Shirley Bassey and Gerry Dorsey who changed his name to Engelbert Humperdinck in 1965. The club was very successful for over ten years with Eddie employing, amongst others, one of his sisters and her husband. Eventually as larger clubs, like the Batley Variety Club, forced up entertainers’ appearance fees, Eddie decided to close the Ace of Clubs. He had already bought the large Lawrence Villa on Station Lane next to Woodlesford station and for the next few years, in the early 1970s, he ran a restaurant there. Later he lived in South Africa before returning to Blackpool where he died in 2008. Click on the link below to listen to Eddie’s sister, Maureen Thompson, and her husband Tom, reminisce about his life and career. 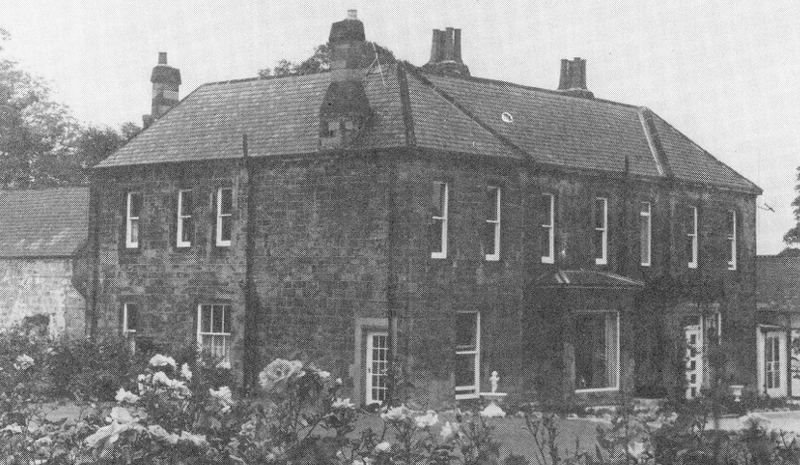 Lawrence House on Station Lane which was bought by Eddie Joyce in 1964.